Live music shows and events venues. How many Barnyard Theatres are there? Seven Across South Africa: five in Gauteng, one in Cape Town and one in Durban. The Barnyard Theatres have grown to include Emperors Palace Barnyard (East Rand, JHB), Gold Reef City Barnyard (Ormonde, JHB), Rivonia Barnyard (Sunninghill, JHB), Silverstar Barnyard (West Rand, JHB), Cape Town Barnyard (Tyger Valley, Cape Town), Suncoast Barnyard (Suncoast Casino and Entertainment World, Durban) as well as our exciting Menlyn Barnyard (Menlyn Park Shopping Centre, Pretoria). The Barnyard Theatre provides an old-world, informal, yet sophisticated environment. Each venue is slightly different however the general layouts, look and feel of the theatre interior are all similar and resemble the original concept. What is the Barnyard Theatre Experience? Barnyard's live music shows transcend boundaries; they are vibrant, uplifting, highly entertaining, and feature the greatest hits of our time. In addition, we regularly host well-known South African bands, comedians and performers. Patrons are encouraged to arrive early, sit around heavy wooden tables to socialise and enjoy a meal before curtain-up, thus providing a one-stop evening's entertainment for couples, families & friends. The Barnyard Theatre is an ideal venue for birthday parties and other celebrations offering extensive catering menus, but also allowing patrons to bring their own meals. Fully stocked bars, coffee and snack bars are conveniently situated throughout the venue. 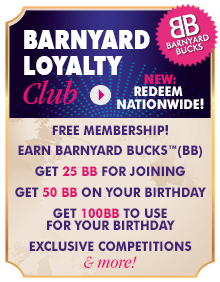 Barnyard’s unique concept; sociability, value-for-money and a one-stop evening out make our Theatres unrivalled. Sit back, relax and let us entertain you! How can The Barnyard Theatre be used as a venue for Corporate and Fundraising events? The Barnyard Theatre has been the venue of choice for many well-known companies. Barnyard can be hired with or without a Barnyard show and offer multifunctional facilities with state-of-the-art equipment, secure parking and wheelchair access. THINK Barnyard for: Presentations, Award Ceremonies, Product Launches, CD launches, Conferencing, Team Building, Training Sessions, Year End Parties, Client Entertainment, Dance Festivals, Matric Dances & Debs Balls, Graduations, School Concerts, & everything in-between. The Barnyard Theatre also offers fundraising opportunities as part of our social responsibility to the community. We offer companies and NPOs a reduced ticket rate, enabling them to re-sell at a profit to raise funds for their cause. Please contact your preferred Barnyard Theatre for more information and to request quotes. The Barnyard Theatre concept is 22 years old this year. How do The Barnyard Theatres source and grow local talent? The Barnyard Theatre identifies talent and gives them the opportunity to earn a living doing what they love and do best. The Barnyard Theatre Production Company owns and produces all the shows and employs all musicians and performers. The company has produced over 110 shows in 16 years, including Under African Skies (Also known as Diamonds & Dust), that has performed at over 80 theatres in Belgium, Holland, France and Denmark where it received rave reviews and achieved excellent ticket sales. Barnyard shows have also been staged internationally in the Middle and Far East, including multiple sell-out shows at The First Group Theatre at the five-star Madinat Jumeirah resort in Dubai. Our productions have also been seen in one of the entertainment hubs of South Africa, the renowned Sun City. You are welcome to bring your own picnic basket or you can order pizzas from the venue.Other food options such as platters, gourmet meals and buffets are available at participating Barnyard Theatres. Pre-order or purchase on the evening. All Barnyard Theatres have a fully stocked bar, coffee & snack bar - own drinks not permitted. Our ticket prices for Barnyard Productions range from R85pp to R185pp. CAN I PRE-ORDER MY FOOD & DRINKS? No smoking, vaping or e-cigarette use is allowed in the theatres. Our venues have designated smoking areas. Children who will occupy a seat pay full price. Most Barnyard Theatres allow Kids U/12 in for FREE on selected days (2 kids per paying – full price – adult). Ts & Cs Apply.